Leroy Ninker has a hat, a lasso, and boots. What he doesn’t have is a horse – until he meets Maybelline, that is, and then it’s love at first sight. Maybelline loves spaghetti and sweet nothings, and she loves Leroy, too. But when Leroy forgets the third and final rule of caring for Maybelline, disaster ensues. Can Leroy wrestle fate to the ground, rescue the horse of his heart, and lasso loneliness for good? Join Leroy, Maybelline, and a cast of familiar characters – Stella, Frank, Mrs. Watson, and everyone’s favorite porcine wonder, Mercy – for some hilarious and heartfelt horsing around on Deckawoo Drive. Kate DiCamillo, the author of six books about Mercy Watson, is the beloved and renowned author of many books for young readers, including Flora & Ulysses: The Illuminated Adventures and The Tale of Despereaux, both of which won Newbery Medals. In 2014 she was named the National Ambassador for Young People’s Literature. She lives in Minneapolis. Chris Van Dusen is the author-illustrator of The Circus Ship and King Hugo’s Huge Ego, and the illustrator of all six books about Mercy Watson. He lives in Maine. DiCamillo … has always been at her best when dwelling on the good and the bad in relationships between humans and animals, and Van Dusen knows precisely how best to present Leroy to us. Kate DiCamillo and Chris Van Dusen strike gold again with this charming addition to the Mercy Watson story-verse. ... As with her Mercy Watson books, DiCamillo manages something extremely difficult in an early reader series—a delicious sense of language that is playful and poetic while also staying accessible and appropriate. 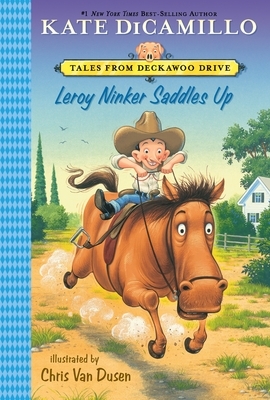 Leroy Ninker Saddles Up is full of immensely likable characters, unexpected plot twists and humor that will appeal equally to kids and adults. Chris Van Dusen's personality-filled illustrations perfectly complement the writing, making this a very enjoyable read-aloud. DiCamillo’s use of inventive and colorful language and Van Dusen’s stylized gouache illustrations make this story click; give this to graduates of the earlier series looking for a bit more of a challenge. Spot art, full-page art, and double-page spreads with Van Dusen’s characteristic shiny-faced characters infuse the plot with extra energy and expression. Part cowboy story and part pet love story, this multi-layered tale beautifully balances comically exaggerated details and true spirit. Mercy Watson fans will enjoy being back in the saddle in this slightly more advanced spin-off. Readers will have a hootenanny of a good time as this rookie cowboy learns to deal with these characteristics, and they’ll be especially pleased to find that the pair’s adventures (or misadventures) land them back on Deckawoo Drive meeting up with a few familiar faces from the Mercy Watson series, including that toast-loving pig. The text is lengthier here than in those books and the sentence structure more complicated, but there’s still the same skillful use of repetition, goofball humor, and easy accessibility. Mercy fans will be quick to cowboy up to this title. Newbery Medal winner Kate DiCamillo has incorporated characters from her popular Mercy Watson series into this charmer. ... Readers who love horses, cowboy fiction, DiCamillo, buttered toast, and the Mercy Watson series will enjoy this title. Fans of DiCamillo's popular Mercy Watson series, rejoice! ... Short, colorful sentences make this a surefire hit, either as a book for younger readers or a family read-aloud. Van Dusen's retro, hilarious caricatures are perfect. This transitional reader offers witty wordplay, a creative storyline, and endearing characters. ... DiCamillo’s brilliant use of descriptive language and character development coupled with a heartfelt message about friendship make this a must-have for the classroom. Colorful cowboy slang and silly caricatures multiply the laughs and together convey the 'yippie-i-oh' happiness at the heart of what becomes a love story.